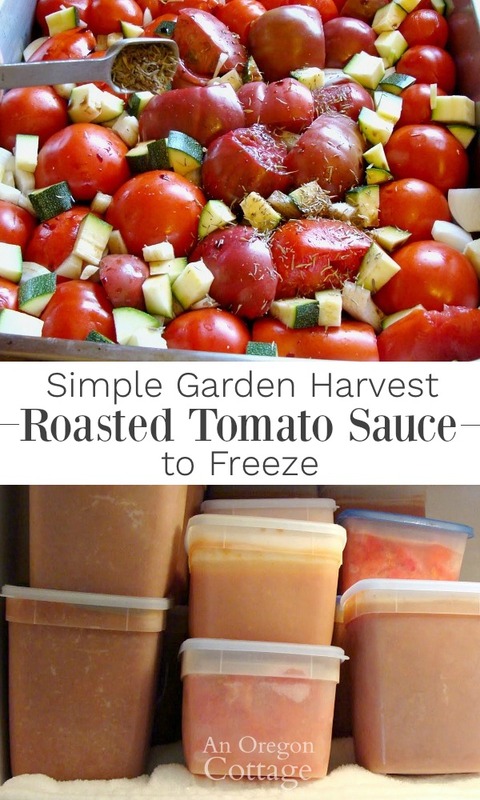 This roasted tomato sauce with optional vegetables has an incredible flavor and is a wonderful – and super easy – way to use the garden harvest and freeze it for later. 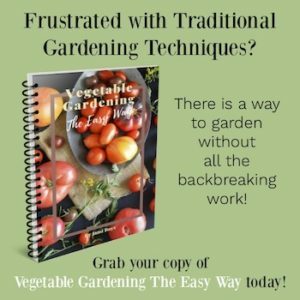 This article is a part of Tuesdays In The Garden, with a theme of Garden-to-Table recipes – the ultimate reward of gardening! 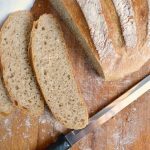 At the end of this recipe, be sure to check out the other great recipe ideas from my gardening friends. Zucchini, Corn & Tomato Saute…well, the list could go on and on. 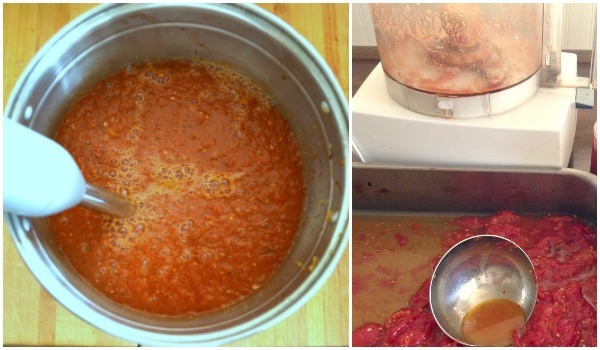 However, the number one way I use our tomatoes is to make this incredible roasted tomato sauce that I freeze to use all year long. And by incredible, I mean out-of-this-world flavor – next to Addictive Tomato Chutney it’s probably everyone’s favorite recipe. 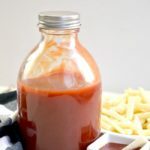 Having this sauce in our freezer is like having a stash of organic, so good-for-you-it’ll-make-your-eyes-roll convenience food ready whenever you need it. 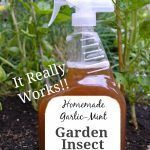 Its also helps that it’s super easy, takes care of a lot of tomatoes at once, and even uses other vegetables that I have if I want to add them. It’s a recipe that fits into almost any schedule – you can get going while you’re making dinner, then puree it and freeze it after. 1. Start with the number of baking pans that will fit in your oven (if you’ve got a lot of tomatoes – you can always do one pan at a time for smaller batches). For me, that is one large 15×10 roaster and two 13×9 pans. 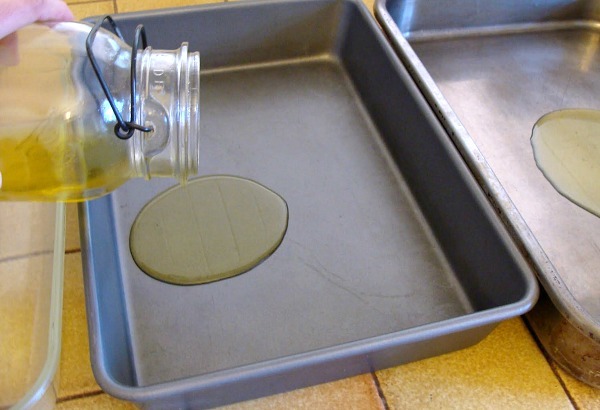 Pour a couple of tablespoons of olive oil into each pan. 2. 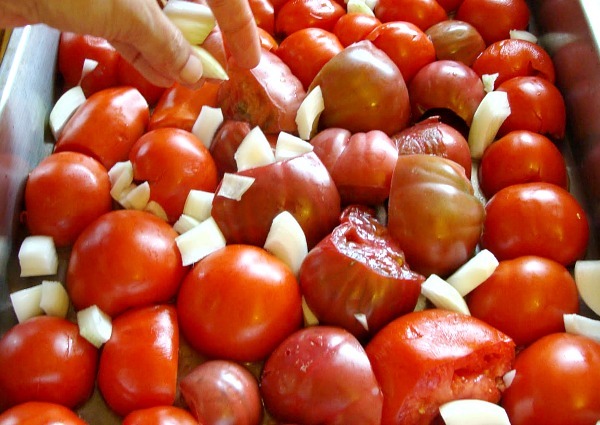 Cut the tomatoes in half and remove the cores. TIP: Plum/paste tomatoes will yield a thick and meaty sauce, but this roasted sauce is usually thick anyway and I like the flavor of all my different tomatoes, especially heirlooms, so I use any ripe tomatoes I have. If I’ve got paste tomatoes ripe, I’ll try to do 1/2 paste and 1/2 slicing in each pan. 2b. 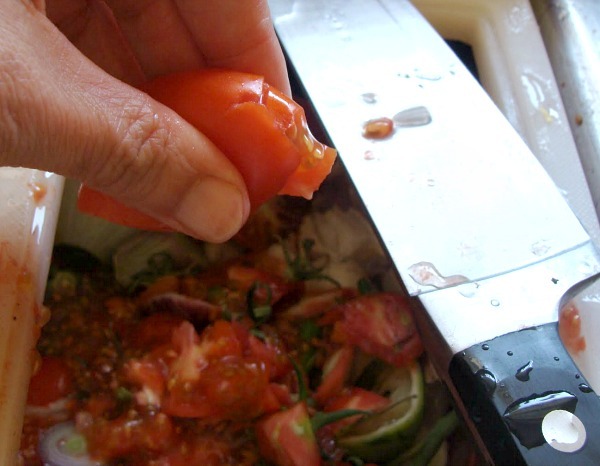 If you’d also like to use tomatoes with more juice, like heirlooms, give a little squeeze to the tomato after cutting it in half. A lot of the seeds come out and you’ll be left with the meat of the tomato. This is completely optional, of course, and there are times I’m in a hurry and can’t be bothered. The sauce is a bit thinner, but easy to thicken at cooking time if you’d like with a can of tomato paste. 3. 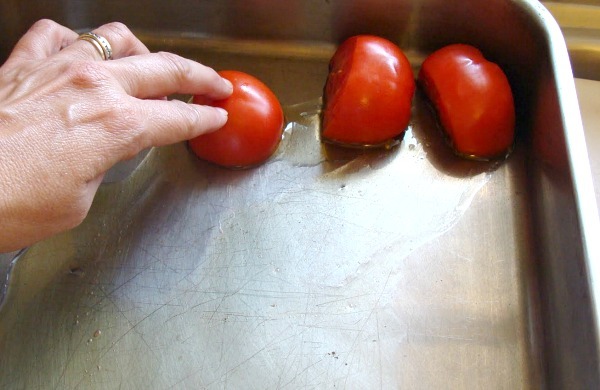 Place each tomato cut side down into some of the oil and slide it to the edge of the pan. Repeat with all the tomatoes until the pans are full with a single layer of tomatoes and the oil has been distributed evenly. Scatter chopped onions over the pans, tucking them into the crevices. I use about 1/2 an onion for each pan. 4. Shhh…this is the part just between you and me. You can add other vegetables to the sauce and your kids won’t know they’re eating zucchini, peppers, carrots, or whatever. Actually, nobody does – and what they don’t know won’t hurt them, right? The truth is – I wasn’t trying to be healthy when I started this, I was just trying to use up extra zucchini, ha! 5. The ingredient I feel is the signature of this recipe? 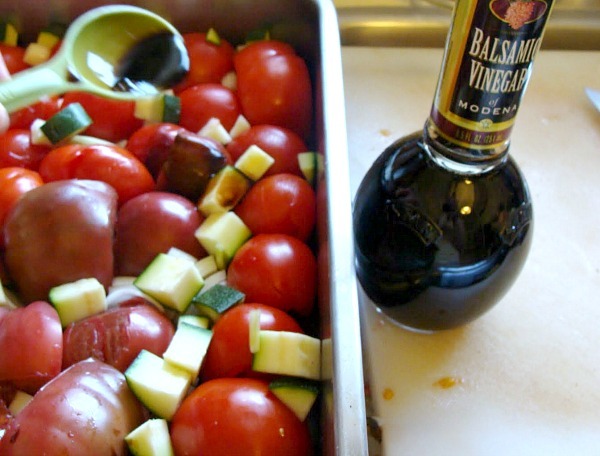 Balsamic vinegar. Add 2-4 tablespoons to each pan to really enhance the vegetables, and resulting sauce, when roasted. 6. Finish off the layers with garlic and any herbs you’d like. Peel and slice or mince garlic, scattering and pushing into the crevices. Then add dry or fresh herbs, or a combination. I usually have basil growing and will use that fresh, then add dried thyme and oregano. Season with salt and pepper. 7. Roast in a 400 degree oven for about 45 minutes, switching the pans halfway through (if you’re using more than one) from top rack to bottom. At this point, most of the skins are browned and wrinkled and I find it easy to just pull them off with tongs. 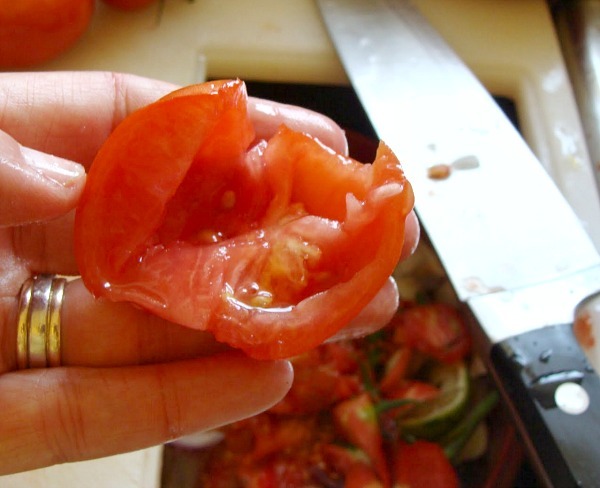 I don’t bother with the ones that won’t come off easy, just the ones that pull off like the one pictured – usually thicker-skinned paste tomatoes. Again, this is optional. 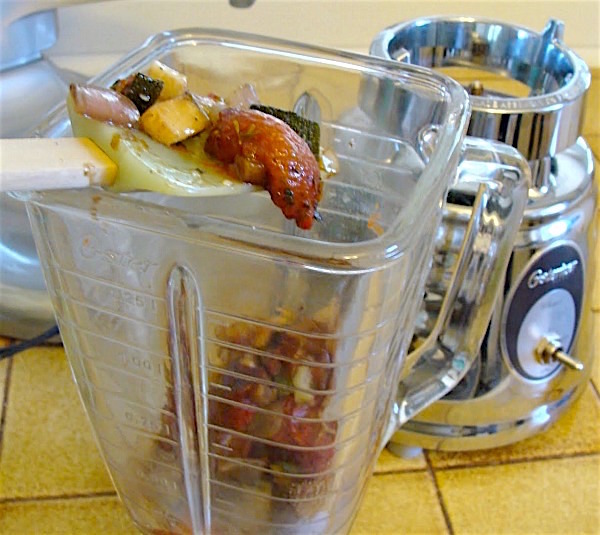 The skins can be left on before pureeing and if they bother you, you can push the sauce through a sieve to remove them. Or you can just eat them. Usually I won’t do another step and I find the sieve takes out some things I want like herbs, so plucking most of the skins is the easiest way to go for me. 8. 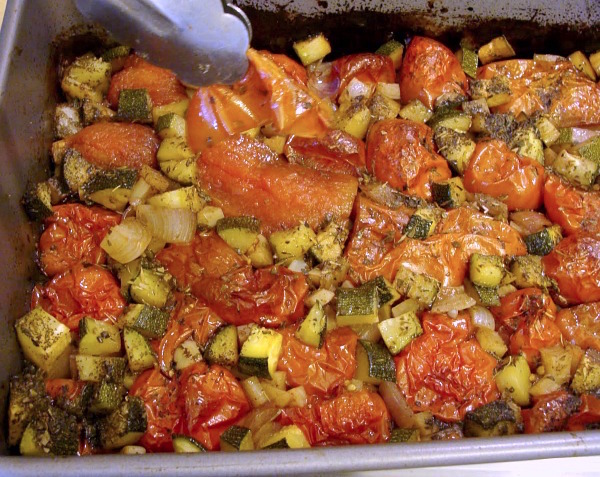 Let the roasted vegetables cool for a few minutes and then use a large spoon to transfer the vegetables (and liquid) into a blender. TIP: Try to get even amounts of vegetables and liquid in each blender batch, otherwise you’ll end up with containers of really thick sauce and one container of super liquidy sauce. Each 13×9 pan is typically enough for one blender, but since I make three pans, I add the contents of the two smaller pans to the largest, mix it evenly and then remove 1/3 at a time to blend. Update: Over the years I’ve tried other ways to smooth the sauce, using an immersion blender (after first dumping all the roasted vegetables into a stockpot) or food processor. Choose whatever way suits you (and your equipment) best. 9. 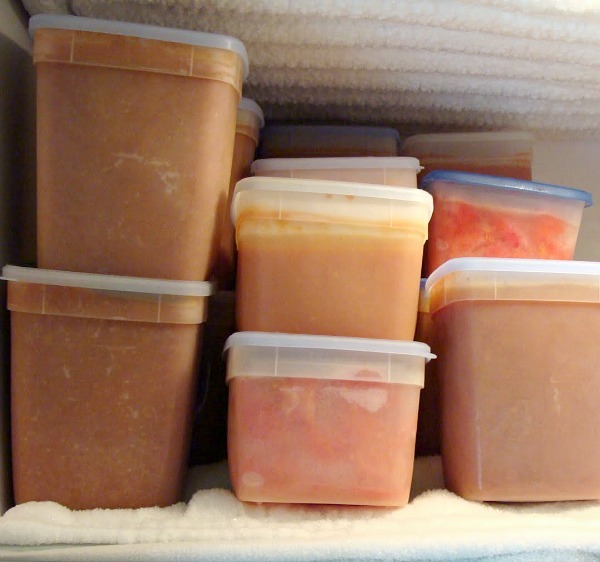 Pour into freezer containers, leaving an inch or two for expansion. The pans I use (a 15×10 and two 13x9s) usually yields about 3 quarts. Date and label each container so you will know what you’ve got when you’re looking for dinner in February. Update: I now use quart glass canning jars to freeze all our tomato sauce. I make sure to leave 2-inches for expansion and haven’t had a problem with breaking while in the freezer, though I’ve lost a jar while defrosting. If you’re like our family, you are going to be SO happy to have taken the time to make this roasted tomato sauce when you’re eating it long after the harvest has passed – and one that’s convenient, tasty, and healthy. 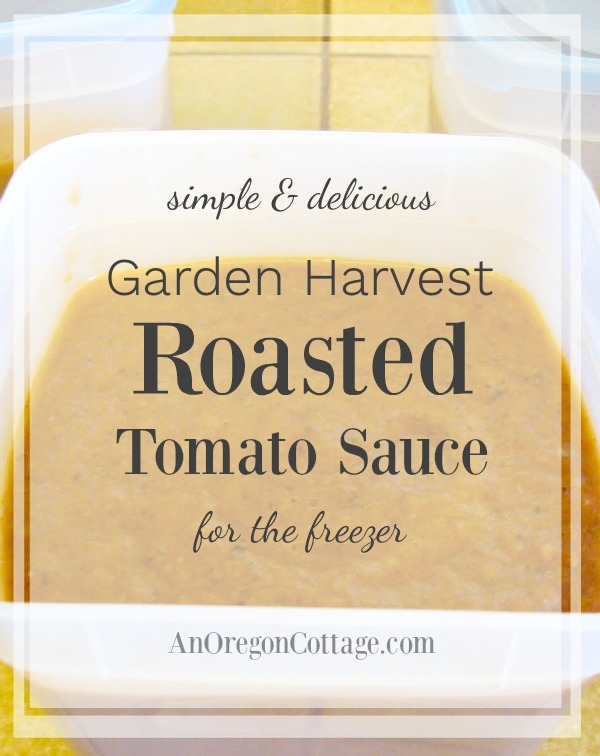 Click the arrow for the full printable roasted tomato sauce recipe! Now this was a bit weird. I used up the last of the Roma’s I picked out at the farm (maybe 2-1/2 to 3 lbs). I used one disposable 13×9 pan and put the rest in my 8×8. I’ve got a small oven so they just fit. I added onion, garlic, sweet red and green peppers, and a wilting zucchini. Plus some oregano, thyme, and basil (and salt and pepper). Oh, and the balsamic vinegar (which works a charm!). I roasted both pans at 400 for maybe 40 minutes. The 13×9 pan contents cooked down and slid out perfectly. The 8×8, on the other hand, stuck and kinda caramelized (not exactly burnt). I scraped out as much as I could and immersion-blended the whole thing. Amazing tasting sauce! Considering the 8×8 pan situation, I doubt I could ever totally replicate this, but I know it’ll still be fantastic! I think I got about a quart, and I definitely will be making this again. Will it work with frozen tomatoes, do you think? Every once in awhile I have a frozen mason jar break (like once in 5 years or so, so rare). I have no idea why, other than there must be a weakness in the jar. Just recently it was a jar of frozen bone broth that was defrosting slowly in the fridge. Sorry this hasn’t been tested for canning and it uses a lot of low acid vegetables, so really isn’t meant for canning. Just wanted to thank you for the article you did last year on the Harvest Pro Sauce Maker. I saved up and bought one this year, and I’ve processed 20 lbs of tomatoes in around 15 minutes. I’d still be grinding if I didn’t have this, and probably wouldn’t have known about it if it wasn’t for you! So, thanks. I make this wonderful recipe every year. 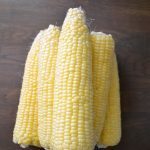 Are there any veggies you have used but wouldn’t add them again? trying to find something to do with them. I don’t grow eggplant, Janiece, but if you like the flavor of them, try adding some. I’ve found it’s a great way to use up veggies. I’ve used peppers, zucchini and other squash, celery, onion. It adds amazing flavor, Michelle! Just made some today and could eat it with a spoon right out of the food processor (which I use instead of a blender). So tasty! I often use it for making tomato soup by adding home-canned tomato juice to thin it a bit. Hope you like this, Angie! 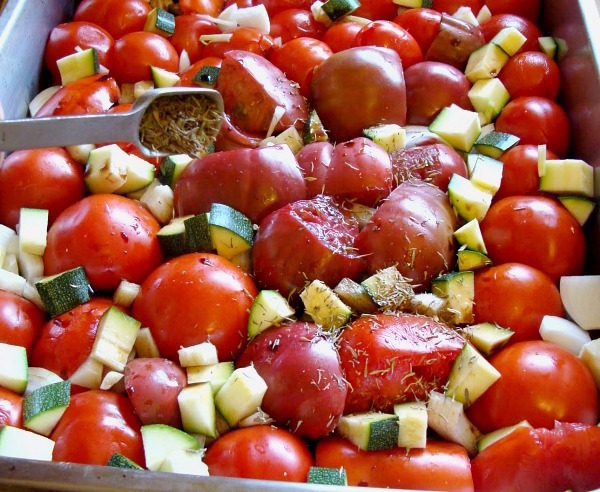 I’m a great fan of yours and this recipe for roasted tomato sauce sounds outstanding! I’m anxious to try today since I’ve got tons of tomatoes awaiting in the garden and a bag of local Walla Walla Sweets that would work wonderfully. I’m going to try roasting them in our pellet BBQ so I don’t heat up the kitchen so much and hopefully it might lend a nice smoky flavor too. I was wondering if you or anyone has ever used quart size freezer bags for the sauce? 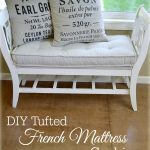 And what is your opinion on using those versus glass jars? I was thinking when it came time to use the sauce how do you thaw it to use for a meal? Thank you so much for all of your wonderful ideas and recipes…love ’em!! Thank you, Marci – I’m so glad to know that. 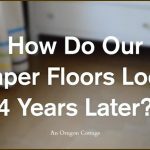 🙂 I know many people who use freezer baggies instead to maximize room in the freezer – do what works for you. To thaw, I’d place in a bowl of warm water until it’s thawed enough to get out of the bag. Wow! This roasted tomato sauce recipe is my kind of recipe! This looks like a keeper and also one to share. I do winter squash and pumpkin in the oven too. I’ve made apple butter in the oven…only way to go with that! Thanks so much. Happy harvesting. Are you helping your Mom put all goodies away against the winter months? I remember those days so well, back on our Iowa farm. Yes, I love that roasted flavor on lots of things, too, Sydra. I actually like a slow cooker for apple butter though. 🙂 I’m hoping to get a good stash preserved this year even though during our moving transition I’ll have to buy vegetables! I love roasted vegetables and I love how you can sneak in zucchini too. Right now we have an abundance of zucchini but no tomatoes yet. I’m hoping we get a few tomatoes soon so I can try this recipe. I LOVE how roasting the veggies intensifies flavor. Such a great standby in the freezer! It’s always nice to zip down to the freezer for handy sauces like this. I must confess that I’m terrible about using things that I have frozen. However, the one thing I do use is my husband’s spaghetti sauce. It really keeps well for a long time in the freezer. So, I imagine that this yummy recipe would too and it’s one that I could see us using a lot. Thanks for the great idea. Now I know what I’m going to so with all the tomatoes I got from the CSA pickup. 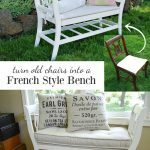 I hope you like this, Patti! This is really neat, when the kids were home I made freezer sauce all the time, just made like easier on those busy days when I didn’t really feel like cooking. I did it completely different. 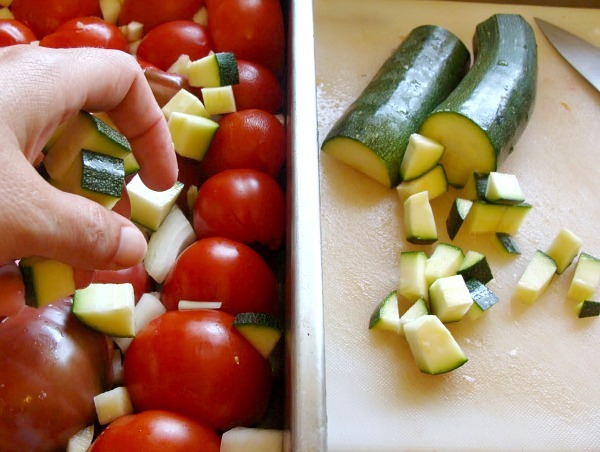 I love this idea and because my kids were picky eaters and not fans of veggies it was the perfect way to sneak in veggies so I grated the zucchini and chopped up mushrooms so they were very small. Green, red or yellow peppers are good veggie to incorporate too, nice flavor.. I made a bunch of these last year and I LOVE them. And I get to use some of my zucchini up! 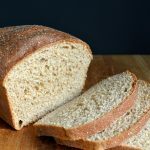 I just now had to find the recipe so I can start on this year’s batch. The only thing I did different is I further condensed the sauce on the stove top. Because I used several different recipes I marked the cans OC for Oregan Cottage so I’d know… and the wife teased me about it, saying it meant Obsessive-Compulsive! HaHa! Just wanted to add that I just roasted the veggies and added all the seasonings on the stovetop. I found the herbs often burned when in the oven. And I saw the question about canning and yes I pressure canned all of mine and they turned out fine. If you’re concerned about the acidity you can add a dash of canned lemon juice (5% acidity) but since the recipe contains vinegar you should be fine IMO. Good to know – thank you for updating, Manny!